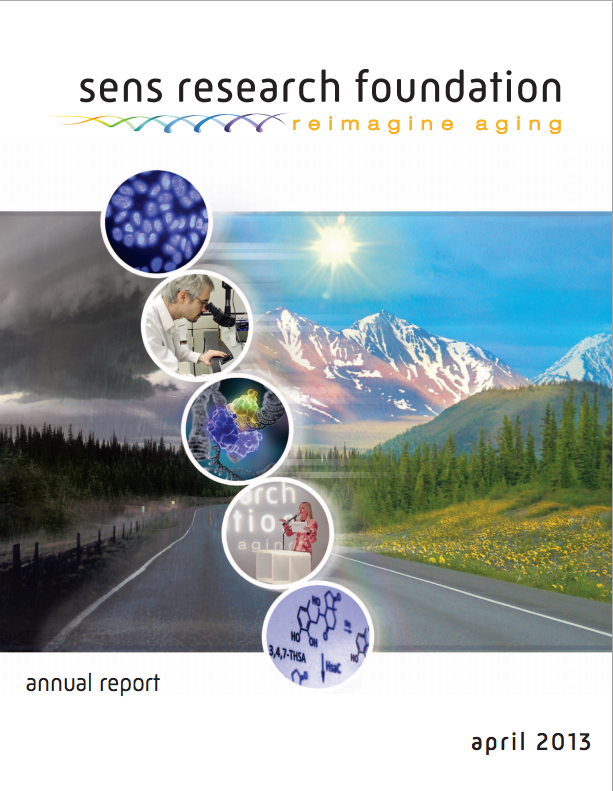 Those of you who are interested in regenerative medicine probably already know the SENS Foundation. As always, their annual report (pdf) gives a good overview of the progress made during the past year. If you are new to these ideas, the book Ending Aging by Dr. Aubrey de Grey is a good place to start. This speech also gives a good overview, though it doesn’t go into as much detail as the book. 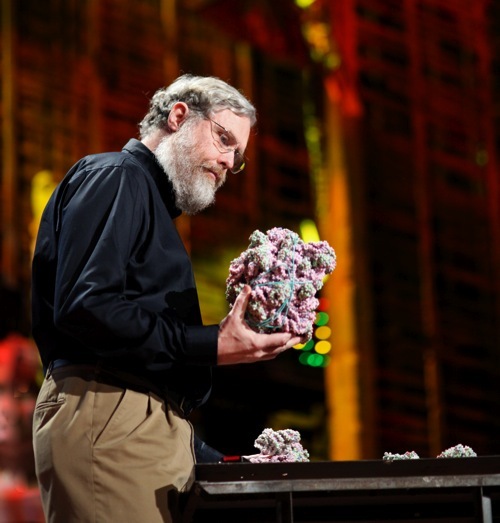 Also interesting to note: George Church, who I wrote about in the post right below this one, has joined the SENS Foundation’s research advisory board. Technology Review has a good interview with the Harvard Geneticist. Dr. Church also has a new book that just came out: Regenesis: How Synthetic Biology Will Reinvent Nature and Ourselves. Biogerontologist Aubrey de Grey, the founder and chief science officer of the SENS Foundation, recently gave a talk at the MIT Club of Northern California. I find his research on the diseases of aging fascinating, and his foundation is the main charity that I support because it has the best risk/reward ratio that I could find (in other words, each dollar spent there has a higher chance of making the world a much better place than a dollar spent elsewhere). If after that you want more, I recommend the book that he wrote for a mainstream book and the medical journal that he edits, Rejuvenation Research. For more on how the Western Diet (high in refined carbohydrates) is causing metabolic syndrome, I also recommend “Good Calories, Bad Calories: Fats, Carbs, and the Controversial Science of Diet and Health” by Gary Taubes. Why? Because he’s one of the leaders and main instigators of the scientific movement working on defeating the diseases of aging, by far the number one cause of death and suffering in the ‘Western’ countries. Future Current has a transcript of the talk that Aubrey gave at the BIL ad-hoc conference (a kind of less exclusive TED). But the best way to experience this is to watch the video of Aubrey. If you are new to all this, I recommend starting with this older TED talk or this longer Google Tech Talk, then this primer at FightAging, and then Aubrey and Michael Rae’s book, Ending Aging. The best way to contribute to the research efforts are to donate to the Methuselah Foundation. Cancer vaccines typically depend on cumbersome and expensive manipulation of cells in the laboratory, and subsequent cell transplantation leads to poor lymph-node homing and limited efficacy. We propose that materials mimicking key aspects of bacterial infection may instead be used to directly control immune-cell trafficking and activation in the body. It is demonstrated that polymers can be designed to first release a cytokine to recruit and house host dendritic cells, and subsequently present cancer antigens and danger signals to activate the resident dendritic cells and markedly enhance their homing to lymph nodes. Specific and protective anti-tumour immunity was generated with these materials, as 90% survival was achieved in animals that otherwise die from cancer within 25 days. These materials show promise as cancer vaccines, and more broadly suggest that polymers may be designed to program and control the trafficking of a variety of cell types in the body. This immediately made me wonder if this technique could also be used to combat some of the diseases of aging that are caused by the accumulation of toxic by-products of metabolism that our immune system isn’t clearing up. For example, maybe we could train our immune system to clear up the mis-folded protein aggregates (beta-amyloids) that accumulate in our brains throughout our lives and eventually, past a certain threshold, cause Alzheimer’s disease. A standard vaccine might do the trick, but maybe this technique could produce a more effective immune response? A study published in The EMBO Journal has identified proteins (calpain and cortactin) that help regulate the sprouting of connections between neurons, a phenomenon known as neural plasticity. This surely has positive implications for the fight to extend healthy life in humans. For more on this topic, see Aubrey de Grey’s TED talk and his book Ending Aging. Iodine Deficiency is Reducing the World’s I.Q. Sadly, cost-effectiveness isn’t always a priority when it comes to humanitarian aid. In the same way that in the environmental sector it is common knowledge that cute endangered animals will receive more help than ugly ones, ease of marketing is also a big factor when it comes to helping our fellow humans. But if the people who manage aid funds (either voluntary charitable donations or tax money) looked for the biggest bang for the buck, salt iodization would become a priority and the world would be a better place. A campaign to iodize salt would cost about 2-3 cents per person reached per year, and it could probably be less since once awareness has be raised salt makers would add iodine to their products because it would become a competitive advantage that would pay for itself. There is another New York Times article from 2006 on this subject: In Raising the World’s I.Q., the Secret’s in the Salt. Addendum: Of course here “I.Q.” is used as shorthand for “intelligence” (whatever that means), and whatever happens, I.Q. will still be periodically normalized to average 100. That’s beside the point that making poor people healthier and smarter is a good thing in itself, and would indirectly lead to more good things. I’ve been convinced for a while that taking vitamin D supplements is worth it, and study after study seems to confirm my choice. In a paper published in the August issue of the American Journal of Clinical Nutrition, [Anthony Norman, an international expert on vitamin D,] identifies vitamin D’s potential for contributions to good health in the adaptive and innate immune systems, the secretion and regulation of insulin by the pancreas, the heart and blood pressure regulation, muscle strength and brain activity. In addition, access to adequate amounts of vitamin D is believed to be beneficial towards reducing the risk of cancer. The study’s recommendation for all adults is to have an average daily intake of at least 2000 IU. Levels under 10,000 IU/day are considered safe (more about toxicity here). If you think you’re getting enough vitamin D just from the sun, the only way to know is to get a blood test for 25(OH) levels. A study showed that over half of residents of Miami, Florida, were deficient in vitamin D, and it gets worse as you go Northward. According to Dr. William Davis, a cardiologist who strongly recommends vitamin D supplements, even a tan doesn’t necessarily mean that you’re not vit D deficient, especially if you’re older (the skin loses its ability to generate vitamin D as you age). Personally, I currently take 4,000 IU per day (in gelcaps like these, not dry tablets, because vitamin D is fat-soluble). If you decide to buy some, make sure to get D3 (cholecalciferol) and not the more expensive but less effective D2 (ergocalciferol). About cost: 4,000 IU per day of Vitamin D costs me about $25.20 per year. There’s really no reason not to do it. And while you’re at it, also get a good multi-vitamin and some Omega 3 (I take around 1200 EPA + 600 DHA per day). Update: Vitamin D deficiency might be linked to Parkinson’s disease. Update: Monthly vitamin D supplement safe and effective. 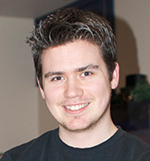 Montreal, September 17, 2008 – Kids and teens surrounded by overweight peers or parents are more likely to be oblivious to their own extra pounds than kids from thin entourages, according to a new study by researchers from the Université de Montréal, McGill University, Concordia University and the Ste. Justine Hospital Research Centre. “When children’s parents and schoolmates are overweight or obese, their own overweight status may seem normal by comparison. The higher the BMI of their friends and family, the more kids are likely to underestimate their weight – a trend consistent for both sexes, regardless of the socioeconomic levels of their school or family,” said lead author Katerina Maximova, a PhD student in the Department of Epidemiology, Biostatistics, and Occupational Health at McGill University. This seems to make intuitive sense, though I wonder how much it also applies to other things. Physical attractiveness? Intelligence? Language skills? Physical dexterity? Empathy and altruism? Perseverance? Honesty? It is no secret that we are influenced by our peers, but how much of it is because of what we are taught, and how much of it is simply because we use the people who surround us as a measuring stick to compare ourselves to? This kind of calibration seems obvious, and I’d really be surprised if there wasn’t a significant correlation between our traits and those of people around us, but I’d love to see real studies on it. It would be especially useful to find out what types of factors can make people not resemble their peers and hold themselves to different standards. Eddie Germino of BetterHumans.com conducted an interesting interview with biogerontologist Aubrey de Grey. You can also read Germino’s review of Ending Aging, the book that De Grey wrote with Michael Rae about his “Strategies for Engineered Negligible Senescence” (SENS). If you want to contribute to the fight against aging, please donate to the Methuselah Foundation. Videos from the first day of the Aging 2008 conference that took place a month ago in Los Angeles are now online. If you are not familiar with the fight against aging, I recommend starting with Aubrey de Grey’s two presentations (one, two), or his TED talk (which has better audio). If you want to dig deeper in this topic, the next logical step is the book Ending Aging, and a good way to keep up with the latest developments is FightAging.org. If you want to help fund research, please donate to the Methuselah Foundation. On Friday, June 27th, leading scientists and thinkers in stem cell research and regenerative medicine will gather in Los Angeles at UCLA for Aging 2008 to explain how their work can combat human aging, and the sociological implications of developing rejuvenation therapies. There’s a press release here, and you can find more information on the official Aging 2008 website. 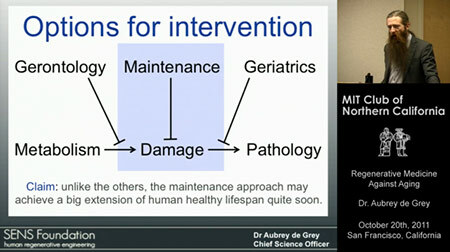 If you are not familiar with longevity science, Aubrey de Grey’s TED talk is a good starting point. If that intrigues you, his book Ending Aging is the next logical step.